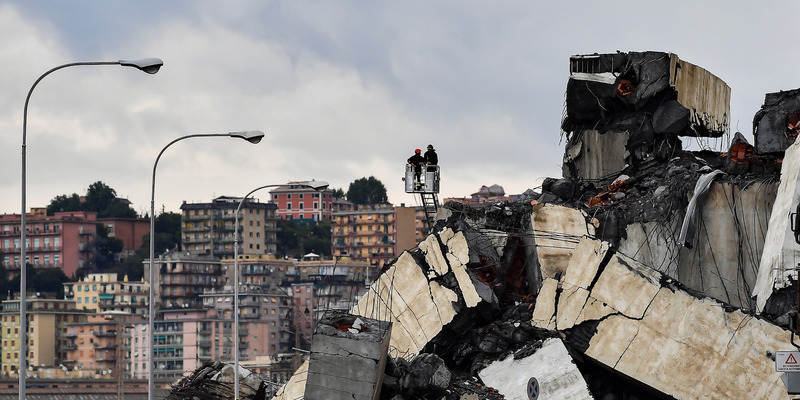 Paolo Rattini/Getty ImagesRescue teams worked overnight after the Morandi bridge in Genoa, Italy, collapsed. At least four people have been pulled out alive from the rubble of the bridge collapse in northern Italy on Tuesday. Rescuers continue to hold out hope for more survivors. Some 400 firefighters remained on the site on Wednesday to help lift chunks of concrete so rescuers could check underneath. They have been able to locate survivors after hearing their voices under the rubble. At least 39 people have died from the disaster. Rescuers in northern Italy worked overnight after a massive highway bridge collapsed on Tuesday morning, hoping to find people still alive in the rubble. At least 39 people died on Tuesday after the Morandi Bridge fell onto buildings below and crushed cars that had been on the bridge, news agency the Associated Press reports. Three children are among the dead, according to Italy’s deputy prime minister Matteo Salvini. But there has been a glimmer of hope: At least four people have been pulled out of the rubble alive, Edoardo Rixi, Italy’s deputy transport minister, told the country’s Ansa news agency on Tuesday evening. As of Wednesday morning, at least two people were missing and a further 16 were injured, officials said. But they have not yet updated these counts after announcing the increased death toll on Wednesday afternoon. Firefighters were able to locate survivors after hearing their voices under the rubble, state broadcaster RAI quoted Bruno Frattasi, the head of the national fire department, as saying. Four hundred firefighters remained on site on Wednesday, lifting big chunks of concrete so rescue teams could check for survivors, Reuters reported, citing the fire brigade. Cranes were brought in to lift truck-sized slabs of concrete, while floodlights allowed rescue teams to work overnight. A video posted by the national fire brigade showed the dramatic moment firefighters pulled a person from a crushed car dangling above the ground. The bridge, built in the 1960s and renovated in 2016, collapsed without warning, plunging cars on the road around 50 meters (164 feet) to the ground. More than 400 people were evacuated from buildings near or below areas of the bridge that were still standing after the collapse, Reuters said.